The Santa Rosa Republican Women Federated will hold a luncheon with guest speaker Dana Bryant, Co-Founder and Vice President, Crossing the Jordan. Her topic will be, “The Scourge of Trafficking and Opioids: We’re Saving People, One Life at a Time.” View the invitation. RSVP: Reply to Connie Senseney at ckozina1943@gmail.com. Cost: $28 with reservations; $33 at the door. 11am Meeting with Lunch to follow. RSVP: For more information and to register for the Atherton lunch, contact Kristin Hueter at (415) 279-0468 or email khueter@khueter.com. Suggested Donation: $1,000. The East Valley Congress of Republicans is a chapter of the California Congress of Republicans. They will host a dinner meeting with featured speaker Milpitas Councilman Bob Nuñez. RSVP: For more information and to register for this event, contact rsvp@eastvalleygop.com. Dinner will start at 6pm, followed by the meeting. The Silicon Valley Association of Republican Women (SVARW) will host a breakfast meeting with featured speaker Linda Paine, President and Co-Founder of the Election Integrity Project. She will provide an overview of the problem with voter rolls and the election process. More details will be provided at a Workshop later that day. The Silicon Valley Association of Republican Women (SVARW) will host an Election Integrity Workshop with featured speaker Linda Paine co-founder of the Election Integrity Project. She will also speak at a breakfast meeting that morning. RSVP: Register online. There is no cost but pre-registration is required. The Republican Club at the Villages will hold their dinner meeting with featured speaker San Jose Councilman Johnny Khamis from the 10th District. Come learn how he’s voting on City of San Jose issues. Learn more. RSVP: Contact Jean Corrigan by April 21 to RSVP and for event details. Cost: $38. Social begins at 5:30pm; Dinner at 6:15pm. The Southern Monterey County Republican Women Federated will hold their scholarship fundraiser including a salad bar luncheon, silent auction and raffle, with music by Lee Schell. View the invitation. RSVP: Buy tickets from any member or call Karen at (831) 385-1333. Cost: $10. The Commonwealth Club will feature David Brooks, author and New York Times Op-Ed Columnist. His topic will be, “The Quest for A Moral Life.” Learn more. RSVP: Register online. Cost: $40 for Member General Registration with a book; $55 for Non-member General Registration with a book; $60 Member Premium plus book; $75 Non-member Premium plus book; $10 Student. 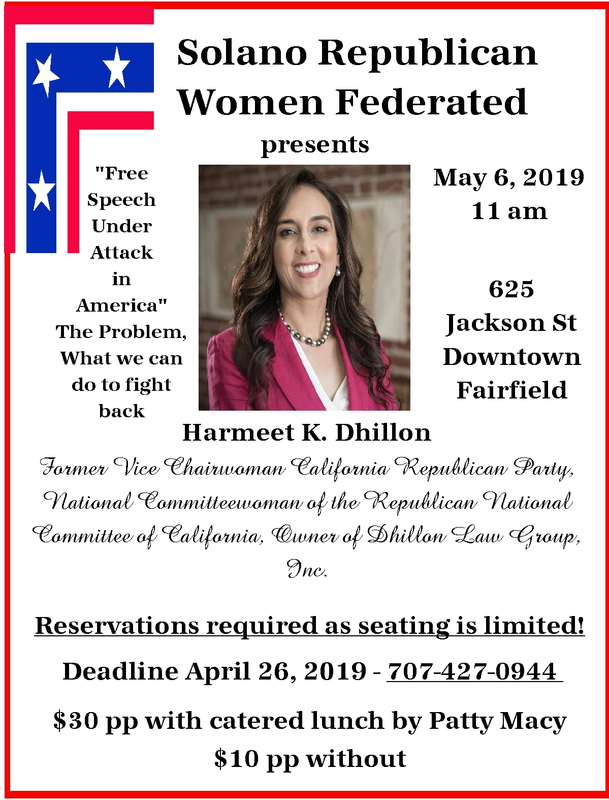 Attorney and Republican National Committeewoman Harmeet Dhillon will be the featured speaker at the Solano Republican Women Federated’s April luncheon. Her topic will be, “Free Speech Under Attack in America – The Problem and What We Can Do To Fight Back.” View the invitation. RSVP: Call (707) 427-0944 by April 26. Cost: $30 with lunch; $10 without Lunch. You are invited to join the Blackhawk Republican Women Federated for hors d’oeuvres, no-host cocktails, and a presentation by CAGOP Regional Vice Chair for the Bay Area Jason Clark and UC Berkeley College Republicans Chair Matt Ronnau. RSVP: More details to come. RSVP: For more information and to make your reservation, visit www.sparcgop.org. Cost: $40 for Members; $50 for Non-Members; $25 for Students. After May 12: $50 for Members; $60 for Non-members. RSVP: Learn more and register online. Cost: $100 for Dinner; $150 for Dinner and VIP Reception with sponsorships available. You are invited to join the Blackhawk Republican Women Federated for their monthly luncheon featuring Instagram and YouTube star Maggie VandenBerghe, also known as FogCity Midge. The South Peninsula Area Republican Coalition (SPARC) invites you to join them for their June Dinner with attorney and victim rights advocate Nina Salarno Besselman. As author of the Amber Alert to publicize child abductions and Executive Board Member for Crime Victims United, Nina has taken a leadership role to promote victim rights. She will discuss efforts underway to promote public safety, including a California ballot measure to Keep California Safe. RSVP: For more information and to make your reservation, visit www.sparcgop.org. Cost: $40 for Members; $50 for Non-Members; $25 for Students. After June 16: $50 for Members; $60 for Non-members. The California Republican Party Fall Convention will take place Friday-Sunday, September 6-8, 2019. The California Republican Party Spring Convention will take place Friday-Sunday, May 1-3, 2020.